Motherhood can be quite overwhelming … can I get an “amen”? The sweet moments on Instagram and the memories we force our minds to recall are quite different than the loud banter and emotional battles we experience each and every day. So, how do we channel the peace? How do we, as parents, encourage our little ones to grow and learn and become calm, happy people? If I had a thorough answer I’d be writing a book, not a blog post. So, no, I don’t have a cure for demanding two year olds or their negotiating counterpart, the unyielding four year old. What I do have is a simple tip; something I’ve found to work wonders with my toddler and preschooler. It’s how to best give the power of choice. I’m the mom, I want control of situations and in some cases, I even need control to keep everyone safe. My son, who is two, also wants control. This is usually in the form of unlimited bananas, movies and anything with the volume of loud. Every day we’ve got a third player, my four year old daughter who teeters on an emotional balance beam in regard to control. Can you feel the chaos and tension? Three, wild spirits all vying for top dog. Max: Bananas! Big bananas! More! More! All mine! Me: I hear that you would like a banana – of course you can have one for breakfast. You also need some protein so would you like a banana and scrambled eggs or a banana and peanut butter toast? Rather than fighting, I propose two options that are both acceptable to me. Max, in turn, feels like he has all the power because he gets to choose what he has for breakfast. Everyone wins! Jemma: You can’t return my ballerina library book! I love it so much! I’m keeping it! FOREVER! Mom: That ballerina book is the best story, isn’t it? I know you love it and the great thing about the library is that we can check it out again on another day. Today, do you want to look for a new book about princesses or dinosaurs? Once you choose a new one, we can make a plan to read it together on the couch or snuggled in your bed. You pick! Princesses or dinosaurs? Reading on the couch or in bed? Again, I do my best to affirm their request and the accompanying feelings. Then, I present two options (or sometimes three or four if the situation warrants that) and allow them to choose. They get to be the leader, making the choice and directing what happens next. 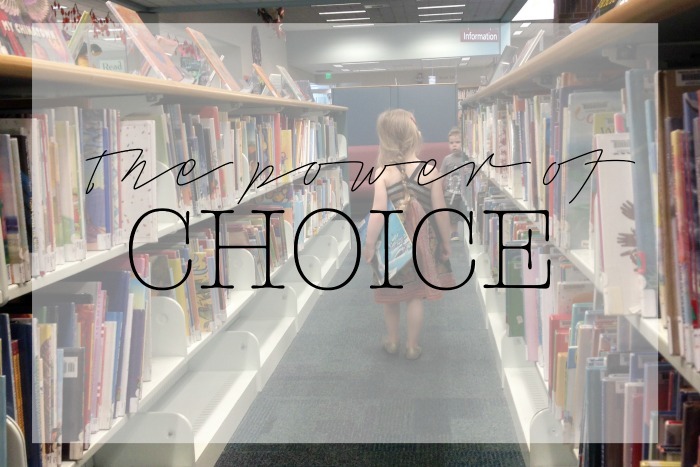 The power of choice is a beautiful thing and one I’m honored to give to my children as often as I can. It’s my hope that by practicing day in and day out we’ll curb emotional explosions and learn to communicate our wants and desires in a coherent way. And that will leave us all calmer and happier! Yay! Have you found success in sharing the power with your little ones? Oooohhhh Max. And Bananas. In our experience that obsession extends until about 3 1/2, almost 4. Once I counted up all the bananas Liam ate in a 12 hour period: 6. Stinker. Good luck!